That flame is certainly one of ardent rigor, which animates Grimaud's playing throughout the entire first movement, with an equality of touch and an admirable polyphonic clarity, no less than the veiled sunlight way she develops a drama secretly inhabited by shadow and light. We love this intensity without hardness, the elastic and profound playing of the Scherzo with strong bass notes à la Schumann. The famous Marche funèbre advances in half-colors to the ringing of inexorable bells, before the central melody of pure creaminess, before the Finale somewhere between being veiled and a rhapsody exploding like a final panic. Hélène Grimaud says that Rachmaninov's second sonata goes "marvelously well" with Chopin's. In fact, it strikes the listener like a prolongation of the Chopin finale and its development in time. The CD will be released in the United States on March 8, but it is already available in Europe. 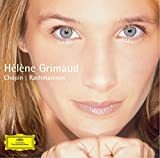 M. S. Smith, blogging at CultureSpace, has a review of Hélène Grimaud's concert with the Los Angeles Philharmonic and some thoughts on her new album. Hi, I found your blog via a google search and I am another classical music lover. There aren't that many good classical music blogs so I am going to link you and come back and read your archives etc.